 Yet another in the flurry of recent volumes advocating choice in schools; this one emphasizes ``the discipline of the market.'' By the former chairman and CEO of RJR Nabisco (now chairman of IBM) and others involved in the educational policy debate, this latest thesis nailed on the door of the educational establishment invokes the quality management theories of the late W. Edwards Deming and the success stories of the RJR Nabisco Foundation's Next Century Schools Program. Funded by $30 million in grants from the foundation, the 43 schools in the Next Century group were scattered all over the country and used their grants to implement programs ranging from a longer school year (in North Carolina) to banishing grades (in Kansas) and parent education programs (in Texas). What the schools had in common was the involvement of the entire school community. A strong principal was critical to success, but so was the commitment of teachers, central administrations and school boards, and parents. The Deming approach stresses teamwork among workers and executives in creating a product that will satisfy the customer. But when talking about schools, who is the customer? Is it the students? The parents? The business leaders who complain that high school graduates are unemployable because they can't read or write? 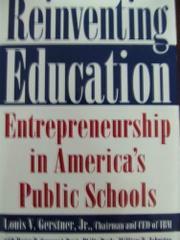 In this case, the authors have the marketplace in mind as the major ``customer'' as they advocate the application of successful business management techniques (e.g., rewards for good teachers; standards of performance to be met by all students) to the process of educational reform. This volume makes an eloquent plea for change if future generations are to meet the demands of the 21st century. As a Maine math teacher puts it, the problem is not that schools aren't what they used to be, but that ``schools are what they used to be''--designed to educate children as 19th- century factory workers, not 20th-century problem solvers. This report on the success of the Next Century schools and their wide-ranging experiments in education is heartening, as is the authors' conviction that if business (Ford, IBM, etc.) can change to quality management, so can education.